This article focuses on Step 2. Developing a research plan is a complex undertaking because it involves so many different decisions. Designing a market research plan begins with determining the most efficacious way to collect the information. Innovative technology has enabled research tools to move to digital environments. Still, the fundamentals haven't changed: A market researcher must determine what data sources to use, the type of research approaches to take, how to limit distortions of the data, what research instruments to employ, how a sampling plan should be configured, how to protect participants' privacy, and what methods will be used to contact research participants. Another critical concern is how much it will cost to implement the research plan. Before the market researcher can determine what research instruments to use, a decision must be made about the data sources. A market researcher can choose to collect primary data, secondary data, or both types of information. Primary data is gathered for the first time for a particular project or a specific purpose. Secondary data exists prior to the initialization of a new research project, having been collected for another purpose. The fresh gathering of data, using primary research constitutes the main distinction between primary data and secondary data is that freshly gathered data is associated with primary research. A common form of primary research data is syndicated research, in which a group of researchers who are interested in the same research problem commission an independent market research provider to conduct a study and share the results with the purchasing participants. While primary data seems the preferable course, a common and prudent practice is for a market researcher to explore possible secondary sources of data to determine if they will suffice to answer research questions. Primary data collection can be expensive. Secondary data is generally of low cost or even available for free, and it is immediately available without having to wait for a research study to be completed. Of course, a fundamental disadvantage of secondary data is that it will generally not have been configured precisely to fulfill a research agenda. As such, secondary data may be incomplete, inaccurate, dated, or unreliable. In such cases, a market researcher will necessarily need to commit to some type of primary data collection process. For gathering primary research data, surveys are the most commonly used of the instruments. Although the survey instrument is flexible and relatively inexpensive, it requires careful attention during development. All surveys should be pilot tested, at least to some degree, before they are released and administered to a target sample. The forms that the questions take should be carefully considered to ensure they perform as expected and that they fit well into the survey document as a whole. Developing survey questions is both an art and a science. Fortunately, many guidelines to survey construction, administration, and scoring are available. Three commonly used psychological tools used to collect primary data are laddering questions techniques, in-depth interviews, and Rorschach-like tests. Laddering questions continue to probe deeper into the perspectives and opinions of respondents. The technique is iterative so that each subsequent question is generated according to the response to the previous question. Laddering is a technique that has been widely used in creative problem-solving methods and workshops. In-depth interviewing consists of probing ever deeper into the customer experience. An interview technique similar to that used in Rorschach testing has been developed for market research by Gerald Zaltman of Olson Zaltman Associates. 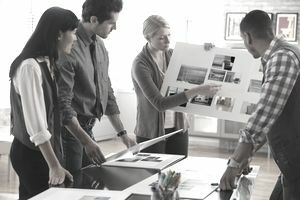 The instrument is known as the Zaltman Metaphoric Elicitation Technique (ZMET) and uses metaphoric images to access the associations that consumers have with certain product types. Typically, a participant in a ZMET-based study will collect images from a wide array of pictures that have no verbal content in order to express the associated feelings and thoughts they have with regard to a product type. Mechanical devices are sometimes used to measure the physiological responses of research participants to product attributes or advertisements. Generally, what is measured is interest or emotions in response to what is seen, heard, felt, or smelled. Mechanical devices used in primary research data collection include Galvanometers, eye cameras, eye gaze recorders, audiometers, and tachistoscopes that show an image or ad for a brief flash. Qualitative measures are becoming more common in primary research as advanced in technology support different approaches, such as online surveys enabled by SurveyMonkey. Consumers are being turned loose with sophisticated technology on which they can record their impressions of product or aspects of their consumer experience. Some market research provider agencies even go into the homes of consumers to film their interactions with products. These videos are trimmed down to a highlight reel that is used to analyze consumer behavior. One of the primary reasons for preferring qualitative measures to surveys or interviewing is that the expressed beliefs and intentions of consumers often fail to match their actual behavior in the realm of brand engagement or purchase decisions. Kotler, P. (2003). Marketing Management (11th ed.). Upper Saddle River, NJ: Pearson Education, Inc., Prentice Hall. Lehmann, D. R. Gupta, S., and Seckel, J. (1997). Market Research. Reading, MA: Addison-Wesley.